The FOX Racing Shox suspension makes it effortless to turn around and maneuver even in the toughest circumstances on desert roads and pathways. 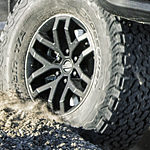 The Raptor has a lockable rear differential, cruise control, and incredible technology features as well. The SYNC 3 software allows you to connect to your phone easily and includes a 360-degree camera to see all of the safety zones outside of your truck as well. You can check out the Raptor when you visit North Central Ford for a test drive. The staff can help you pick out the perfect customized truck for what you need.